Mary Anning, as you may easily read, was from a humble local family, but the scientific quality of her original work was a lot greater than one would suppose. Being a woman and of lowly status meant that her name did not appear in the august scientific publications. Nevertheless she rubbed shoulders on intellectually equal terms with the greats of her age. 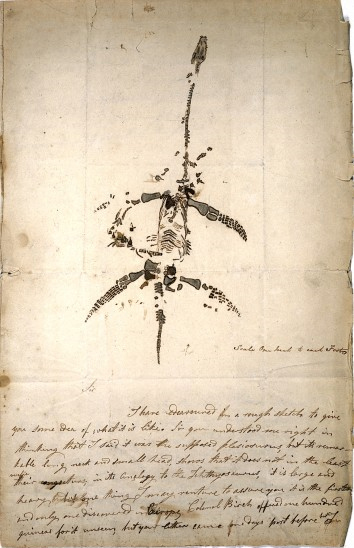 The Mary Anning room in Lyme Museum has examples of her original fossil finds, her drawings and so on. There is a letter, with a description and diagram of a large ichthyosaur, to the geologist Adam Sedgwick (offering it for sale at £4). There is a description of her joint fossil-hunting excursions at Black Ven with William Buckland, Sedgwick’s predecessor in geology – who was born in Axminster, my local town. One of the most interesting exhibits is her commonplace book, which contains gleanings from writings that inspired her. It is actually availble to see online here. 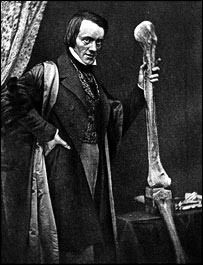 If you look carefully you’ll see that it came from the library of Richard Owen, who founded the British Museum of Natural History in South Kensington. In other words, pretty well all the great names of early natural history before Darwin had dealings with Mary Anning; this was the team that built the knowledge of modern geology and palaeontology – long before the Copes and Marshes of North America. 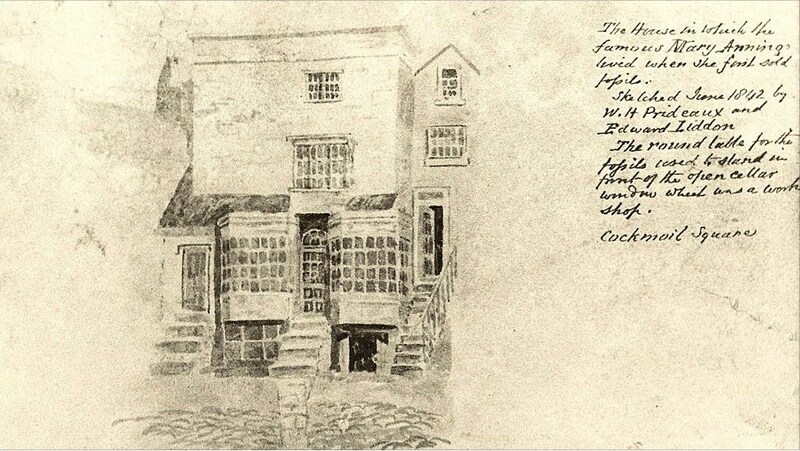 But the interesting thing to me was the content of Anning’s commonplace book. There is science – a passage on the solar system from some scientific work, for example. But the page displayed in the museum has a long passage about the coming of the Redeemer through the offices of a woman. Other pages contain poetry from all kinds of sources, but with a preponderous of sacred hymns. Read her biography and you’ll find she began in the Congregationalist Church at Lyme, and then moved to the parish church, where she is buried – incidentally my friend is the organist there, and they have a superb new organ on which the finest British organists come to do recitals: worth a visit if you’re ever in England. But Christian faith was clearly central to her life. But here’s a thing – every other one of those venerable names I have mentioned in association with her was also a convinced Christian. Buckland was a proponent of the Gap Theory (as I described in more detail here), and a Conservative Christian favouring the kind of natural theology propounded by William Paley. He was the first reader in geology for the Royal Society, the first Chair in geology at Oxford and later Dean of St Paul’s Cathedral. 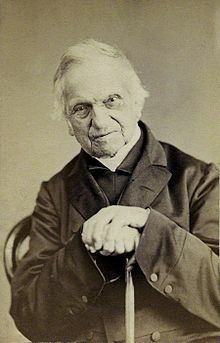 Sedgwick too (he the Professor of Geology at Cambridge) was convinced by the geological evidence supporting an ancient earth with a number of creation-events, each destroyed by catastrophic occurrences. 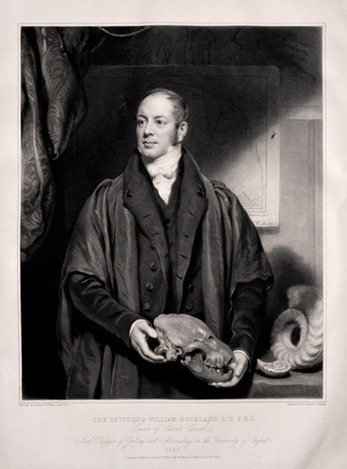 In this he opposed the uniformitarianism of Lyell, but though that came to predominate, Sedgwick has been vindicated by the modern position that there have been at least five major extinction events in geological history, followed by repopulation with a much depleted remnant leading to whole new faunas (and flora). As for Owen, he was undoubtedly a believer, though he is remembered as an unpleasant and vindictive character – but some historians suspect that is largely the story spread by his opponents, whose ideas prevailed over his – history is written by the winners, and Thomas Huxley, for example, is not the most unbiased source! Be that as it may he opposed Darwin not because he thought evolution was incompatible with Christian faith, but because he thought evolution’s mechanisms were far more complex than Darwin’s theory allowed, promoting as most important a form of the structuralism described in the new book by Michael Denton, which has been reviewed favourably by both Darrel Falk and our own Sy Garte (on BioLogos). In other words, he was (as it were) in favour of extending or replacing the “Modern Synthesis” a century before it was even formulated, and so would appear to be just coming into fashion now, as the Neodarwinian paradigm struggles to survive. Maybe Owen, like Wallace and Paley, would be another denigrated name worth reading, with the possibility that he was right all along, but eclipsed by prejudice. The evolutionary or anti-evolutionary views of these people varied, and as far as they existed within the world of Mary Anning were well before Darwin came on the scene – Mary herself died in 1847. But they all demonstrate what needs both to be reasserted and acted on today: that the science of origins never began as a secular reaction to entrenched Church dogma, as the unhistorical myth peddled by both atheists and Creationists continues to assert. It was believers, some of them Evangelicals, who were at the forefront of grappling with the newly emerging evidence from the earth, and with seeking in various not-so-implausible waysto reconcile it with the faith of the Bible, taken as God’s own word. Christians, particularly those of the Evolutionary Creation persuasion, need to reclaim that heritage both by proclaiming it loudly against the secularist “authorised version” of history, and by insisting on the truth that Christian faith is still the best basis on which science can be done. That means, too, having the courage that these early scientists had in holding to the truths of biblical faith, even as they dealt honestly and rationally with the data. This entry was posted in Creation, History, Science. Bookmark the permalink. You write that these naturalists believed in an ancient earth, with ancient animals (i.e. evidenced by fossils). Also, that they were Christians, some of them Evangelicals. Given their Christianity, I would assume they believed in the Devil and his evil spirit cohorts. Did these people ever explain, or speculate, in writing, what the hell was happening on earth for millions or billions of years before human history? I mean, what the Devil was doing during that time? I’m not aware of it – but then I’ve still to read much of their original work integrating their science with their theology. It probably rather depends on how affected they were by the newly-developing view (from around Wesley’s time only) that Satan had somehow got hold of the handle of the natural world. You don’t find that in earlier centuries at all. If they did hold such a view, then they’d no doubt have considered that Satan had no malevolent power until after the fall, which under the Gap Theory was the traditional 6,000 years ago. After all, Satan’s power is destroyed by man’s redemption, so can only have been gained through man’s fall. If they retained the older theology, then Satan never had any role in nature anyway, and probably had some other job, having no sinners to accuse before God. So I conclude that, if they had some idea that Satan was responsible for dinosaurs and ice ages (which I very much doubt), they’d have been engaging in very imprecise speculative theology.